All of our products are created from the finest English sustainable hardwood’s like Walnut & Sycamore. We also create exclusive items from exotic wooden relics. 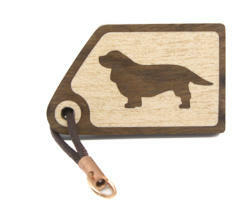 Maybe you would like us to make a product out of any piece of nostalgic wood you may possess. Anything from Blackbeards wooden leg to a memento of a close friend or family member. Fill in the order form and enter in the comments section what you would like us to do, and we will send you a quote. A profile picture is generally a side view. (If you prefer another angle, send us your picture and we will see what we can do) Photographing your pet, try to take the shot with the legs directly behind each other. If your shot is slightly at an angle don’t worry as we can generally manipulate the image to look correct and of course you will approve it first. This is a one time charge on top of the product price to create the personal template for your item. Repeat orders are at normal product prices. After submitting your order, you will receive a confirmation email. 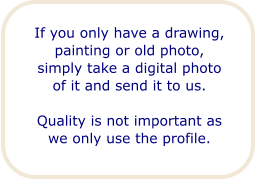 We will then process your pictures and forward you a “Profile Approval Sheet” containing a draft of your completed item(s). You may either reply with any adjustments you may require or approve the design. Once your approval is confirmed we will invoice you by email. On completion of payment, crafting will commence and your item will be dispatched by Royal Mail First Class…. The amount of characters differ, depending on the product. We advise Keyrings maximum 25-30 characters, Pendants 12 - 15. Enter your message on the Order Form comments box.